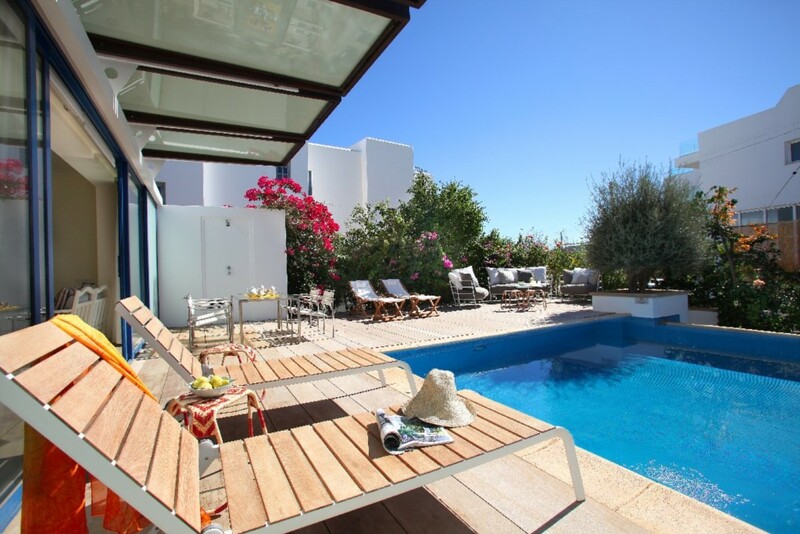 Naxos is a modern, comfortable and luxurious holiday villa which spreads on over 100 square meters surrounded by a lovely Mediterranean style garden including hibiscus plants, fragrant jasmines, bougainvilleas and olive trees. Both indoor as well as outdoor the villa is equipped with simple yet elegant and modern, high quality furniture and all the necessary electrical appliances. The kitchen itself is a peace of art being fully stainless steel with corian work-top and a fitted double door fridge freezer. The ground floor features an open plan living room, kitchen and dining room that unfold and join the outdoor area where a natural high quality timber deck surrounds a private swimming pool. There is also a guest WC and separate shower room as well as an outdoor shower for the pool area. The first floor is made up of two large double bedrooms both en-suite. The third bedroom located just outside the villa (it's entrance adjacent to the entrance of the villa) but does not communicate with the inside of the house has it's own full kitchen, TV, air-condition, ensuite shower room and double bed. Overall Villa Naxos is ideal for a family or a romantic holiday just a short walking distance to all amenities and one of the best beaches in europe as voted by Tripadvisor and yet in a quiet esidential location. Villa Naxos is a unique and elegant property in a quiet cul-de-sac on the coast of Central Protaras, just 2 minutes’ walk from the famous blue flag beach of Fig Tree Bay known for its crystal clear waters and white sand ideal for families with young kids. The Central Protaras Strip is within a short walking distanceand there you can find all restaurants and taverns, pubs, supermarkets, shops, clinic, pharmacies and much more.